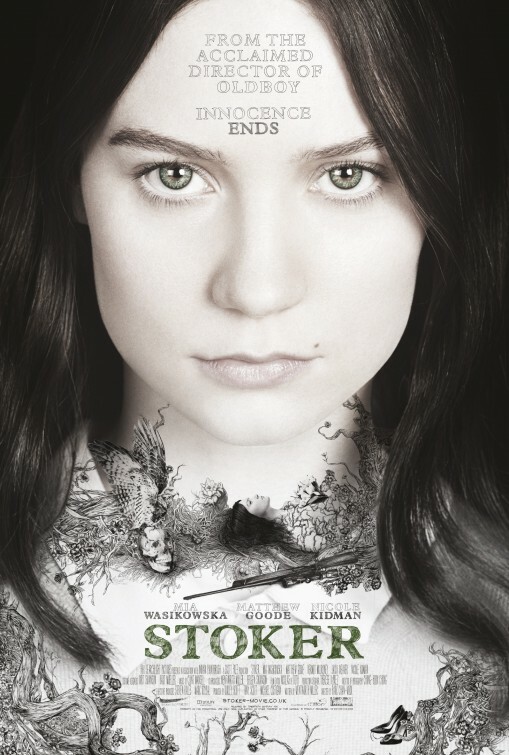 Written by Wentworth Miller, who you may know as one of the stars of the television series Prison Break, and heavily indebted to Alfred Hitchcock’s Shadow of a Doubt, Stoker is a coming of age story with a difference. Think less Stand by Me and more Carrie. India Stoker is a morose teenage girl, darker than your normal morose teenage girl, uncomfortable in her own skin and unsure of her identity. When her father, with whom she was close, is killed in a car accident she is left without a buffer between her and her troubled mother, with whom she has a strained relationship. Living alone together in large Southern mansion, they are surprised by the arrival of her Uncle Charlie, a brother of her fathers whom she didn’t know existed. Charlie arrives out of the blue and declares his intention to stay for a while. He is young, handsome, and well-travelled, and instantly charms India’s mother, while India is more cautious and distrusting of this mysterious uncle. With time she finds this distrust matched with a strange sense of kinship, before learning the dangerous truth about Uncle Charlie… he is a psychopathic serial killer. This psychological thriller is directed by Korean filmmaker Chan-Wook Park who gained international attention in 2004, when his revenge thriller Oldboy won the Grand Jury Prize at the Cannes Film Festival and became a cult favourite around the world. Stoker marks his first foray into English-language filmmaking and he has no trouble applying his immense talent for visual storytelling to a different language. The images are masterfully composed, and cleverly edited together, including an interesting transitionary device where items that appear to be part of one shot end up becoming part of the shot on the other side of the dissolve. Stoker has a creepy, chilling tone – established through the way the picture is photographed, the performances of the actors, and the music – that elicits quite a visceral reaction. Before you process the narrative information, before you understand what is going on, you are already feeling that sense of unease and mistrust. The film has a Gothic feel to it, no doubt resulting from the fact that much of the action takes place in the Stoker’ old Southern mansion, which looks unchanged since the 1930s. In fact, it makes it initially quite difficult to pin down a time period for the events. You find yourself assuming that you are watching a period piece from the first half of the 20th century until we get a couple of scenes at the school which makes it apparent that it is the present day. Stoker’s second half lacks the subtlety of its slow-burning first half, with that spookiness and sense of menace that is so overpowering in the film’s early passages making way for more direct, confronting images of violence. The eroticising of these acts of violence adds another disturbing layer to the bond being formed between India and her uncle. Stoker will only receive a limited release, and likely won’t make a huge impact, but it could well be one of the year’s best films. It is a fantastic psychological thriller: creepy, compelling and strangely beautiful.